We would like to discuss it to the point, without beating around the bush. 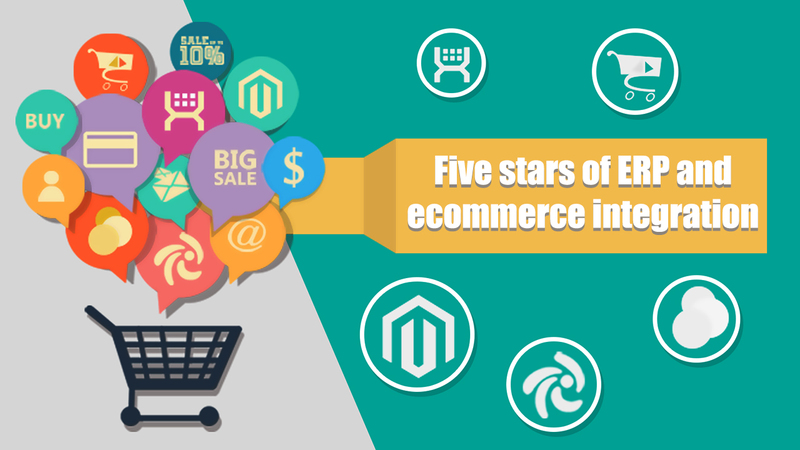 There are five awesome benefits of having ERP integration with your ecommerce website, which we consider as 5 stars of ERP and ecommerce integration. Bidirectional Integration reduces manual data entry and provides effortless automated system. Bidirectional flow of data in the sense there will similar set of information of data available in both the systems. i.e, ERP and ecommerce website. If there is any update in the one of the system quickly it will get updated in other system, this constant flow of data is maintained on both sides. Here your ecommerce website’s purchase orders can be synced with the inventory system, which could provide user satisfaction. Since there is constant updation in data both sides there are less chances of manual errors. If you remember your chapter which you studied during the days of your college, which was on errors. There it was mentioned wherever there is manual work included in terms of typing, writing or any others efforts, there the chances of errors exists. So we cannot blame a single person for this, it is because we are humans and we only make mistakes. So to avoid such type of humane errors we can trust on automated systems. There are certain steps that are included in ordering status. From ordering a product online till the delivery we have multiple steps included in the middle. This order tracking helps a customer to have an idea about when can they expect their order arrival. So integrating your ecommerce system with an ERP this order tracking system gets automated. If you are a ecommerce website owner then you have to create a page for order tracking, here the customer can enter his details and track his purchased order.This will automatically reduce your customer service efforts as information gets updated in the automated system which would be reached to customers. When you have centralised data in your system at that point you can get the reports of your ecommerce business. It will give you the better view of your online ecommerce business. This will help you to get graph of your business, thus helping you in decision making. You will have handful of happy customers with you who would love to visit your website again and again. When you have such swift operational softwares then this will provide great user experience to users. If you want to provide such customer satisfaction for then you can go for this dynamic integration solution. When your system have automated work handling there less resources can be included in this work. Since there will be less of manual work, you can engage your resources more productively. Thereby increasing your company’s efficiency. Not only that there will be ample of cost cutting.